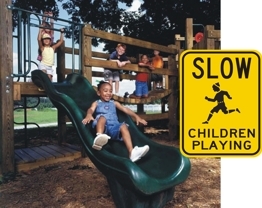 Prevent those drivers from racing thru your neighborhood with Street Sign USA's selection of slow signs. Slow them down by reminding them they've entered a residential area or have approached a community park or clubhouse. Accidents are less likely to happen if a slow sign is posted. Make your neighborhood safer for kids, pets, & people alike! Rust free .080" alodized aluminum is strong & resists the elements.